I was fortunate to go to one round of the Masters and two rounds of the Heritage Classic, in Hilton Head, this Spring. As always, I spent a great deal of time watching the pros practice. I noticed a trend or change of thought in short game theory that is worth noting and passing to our students. Remember, tour pros base technique decisions on the best general result because it translates directly to money. They don’t chase theories that produce spotty results. In years past the tour pros felt like they were better off, when chipping, becoming adept with one or two clubs and then picking different landing spots. These clubs were generally some form of wedge. Now I see them using more of a Paul Runyan type of theory, which asks the player to refine a chipping STROKE and choose the right club to fit the length of the chip. Think of the reasons. They play on increasingly slick greens. They need a stroke that has the ball moving slow. To have deft touch, you must choose the club that allows the swing to be short and the clubhead to move slowly, on a shallow path along the grass. With the new, tight Bermuda grasses, understanding the grain is very important. Northern players are learning that their method developed on lush grass doesn’t travel well on tight Bermuda. A wedge swing that has the clubhead raising quickly and and using speed is very dangerous, especially against the grain. A less lofted club employed with a putting type stroke is much more reliable. I explain it to my students like this. If it is a younger student I know they are probably addicted to too much loft. I teach them that tour pros don’t shoot low because they pick difficult shots to play. They use their considerable talent to play easy shots, with less lofted clubs, because they know that they are very comfortable using a small, slow swing. Why select a bigger swing that worries us? This Spring we saw many tour pros chunking wedges (not just Tiger )because they didn’t know how to deal with the grain in the grass. I convince my younger students to use their increasing skill to open their mind and develop a menu of shots. Why take a talented athlete and make them one-dimensional? It isn’t hard to show a student that chipping up a hill with a lofted wedge is silly. You have just selected a club that is fighting your intent. 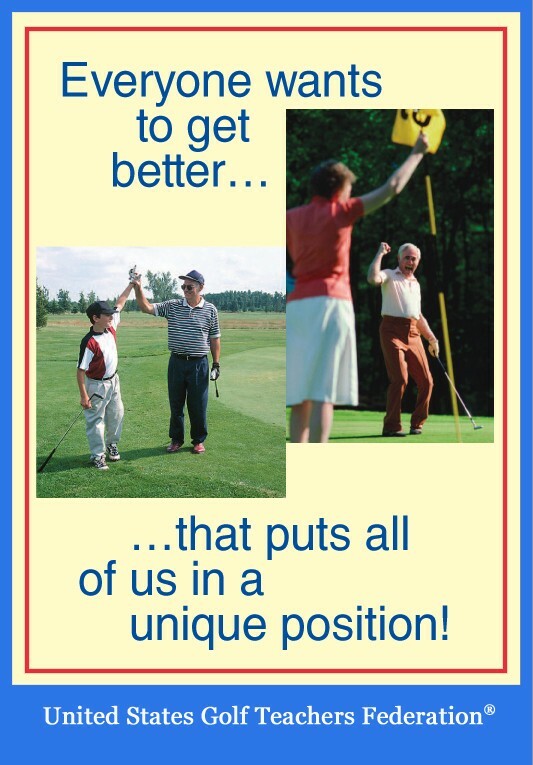 Older students are better served to find a chipping stroke that is comfortable. Ask them to imagine their stroke on a six foot putt. If it is smooth and disciplined, show them what that stroke will do with different lofted clubs. It is a real eye opener. It can quickly breathe life into a shaky chipping method. The technique is simple. Raise the handle up until the club is almost sitting on the toe, with the heel slightly in the air. You are putting the handle between your forearms and under your shoulders, much closer to the line of the shot. It will likely feel more comfortable to use your putting grip. Standing this close to the ball, the path of the swing becomes very precise. Stand with the feet close together. Play the ball nearly on your right toe. Lean the shaft toward the target until your hands are over your left leg. Put your weight on the left foot. Now imagine that you are putting a six footer, with a smoth STROKE instead of any hit. The ball will come off rolling slowly, which is exactly what we want for chipping. Soon a 50 foot chip is nothing more than the right club selection and the same comfortable stroke we always use. If our decision making process keeps us relaxed and confident, we have set the stage for a level of performance that we can sustain for many more good shots and holes and rounds of golf. Why would we torture ourselves with risky decision making?